DBIA Certification – Don't Miss These Opportunities! DBIA Certification is becoming more and more in demand. Whether you’re a pre-award or a post-award practitioner, more owners are requiring or favoring teams with design-build credentials. Owners are also finding the credential useful for themselves. DBIA is offering two additional Certification Workshops in 2014 – November 3-7 in Covington, Ky., and December 8-12 at DBIA headquarters in Washington, D.C. These are your last chances to fulfill the requirements for your Designated Design-Build Professional™ or Associate Designated Design-Build Professional™ this year. Sign up today! On Nov. 17-18 in Miami, Fla., the National Council for Public-Private Partnerships (NCPPP) and the Performance Based Building Coalition (PBBC) will present the nation's only educational event dedicated to developing and implementing public-private partnerships for public projects. Sessions will include how P3s are structured, what owners look for and balancing public and private interests, among other subjects. The Rolls-Royce Advanced Aerofoil Machining Facility in Prince George County, Virginia was a winner at the 19th annual Design-Build Institute of America (DBIA) 2014 Project/Team Awards. The project won a National Award of Merit in the Industrial/Process/Research Facilities category. It went on to win a National Award of Excellence in that same category. A team of students from Milwaukee School of Engineering captured first place at the National Design-Build Student Competition during the 2014 Design-Build Conference and Expo held in Dallas, Texas, the first week of October. California Assemblymember Luis Alejo said he would not support state water bond funding for Monterey County's Interlake Tunnel project unless the county uses the design-build process outlined in state legislation he authored. Alejo, a Watsonville Democrat, told The Herald that he had "made it clear" to the Board of Supervisors on Tuesday he would not back allocating $12.5 million from the $7.54 billion bond on the November ballot if the county pursues a different course on the $25 million water storage project. The California Supreme Court cleared the way for further construction of the state's $68-billion bullet train when it declined to hear an appeal filed by Central Valley opponents of the controversial project. Other financial and pending legal challenges could still pose problems for the massive undertaking. But California High Speed Rail Authority officials said the high court action was a key victory that would allow them to move beyond preliminary work on the first 130-mile section of Central Valley track. Sen. Barbara Boxer, D-California, Chairman of the Environment and Public Works Committee has made it clear that saving the Highway Trust Fund is among her top priorities. In a letter to Congressman Dave Camp, Chairman of the House Committee on Ways and Means, and Congressman Sander Levin, she urges for help in finding a long-term solution. It’s hard to overestimate the importance of manufacturing to Kentucky’s economy. The state is home to more than 4,200 manufacturing facilities that employ roughly 231,000 people – that’s 11 percent of the commonwealth workforce, according to the U.S. Bureau of Labor Statistics. Nevada's announcement several weeks ago of the deal to bring Tesla Motors to Nevada included a projected $40 million for the right-of-way to complete USA Parkway. Recently, the Nevada Department of Transportation made that official. The NDOT board of directors, led by Gov. Brian Sandoval, approved approximately $43 million in costs for right-of-way, easement and existing road improvements on USA Parkway. More than two hundred people crowded into the cafeteria at Virginia's Albemarle High School to express their thoughts about design features of three major construction projects in and around U.S. 29 that Virginia Department of Transportation officials hope will be constructed within three years. "We've got three design-build projects that are being advanced as part of one contract," said Lou Hatter, a communications manager with VDOT. For additional Industry News, see DesignBuildDoneRight.com. Share Your Winning Spotlight - Order Your DBIA Duplicate Awards Trophies Today! It's always impressive to walk into an office and be immediately overwhelmed by the awards on display. Impress your clients by adding a trophy to your shelf or by ordering a trophy for your design-build team members to share the spotlight! 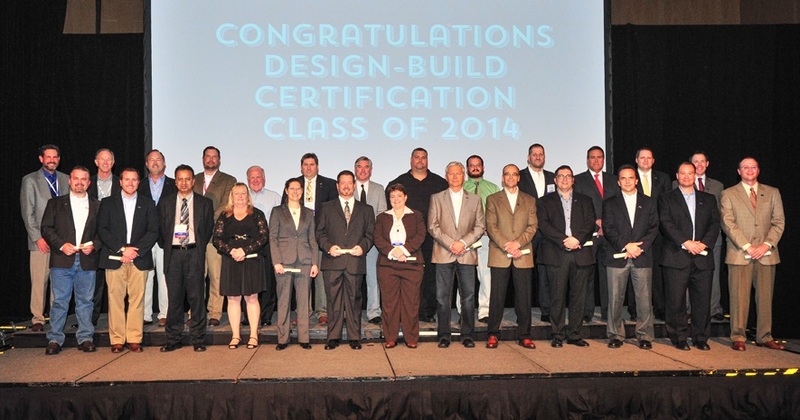 DBIA's 2014 Design-Build Project/Team Awards competition has recognized 25 design-build projects with awards this year. Celebrate this honor with your colleagues, clients and team members by ordering a personalized award trophy today! DBIA Award trophy orders can be placed online through: www.theawardgroup.com/dbia or by calling Charity Concepcion at 212-473-7000 ext. 209. DBIA is pleased to present the schedule for educational events for next year. Register online or refer to the brochure for a printed form. DBIA Logo Apparel for Sale! If you missed us at our Annual Conference in Dallas, Texas, you still have a chance to please an apparel order for NEW DBIA logo apparel. These can make great gift ideas for the upcoming holidays. Please use the PDF catalog order form. New member listing as of Oct. 20, 2014. Oct. 24, BIM Execution Planning, Seattle, Wash.
Oct. 24, Conceptual Estimating, Fairfax, Va.
Nov. 13, BIM Execution Planning, Atlanta, Ga.
Dec. 8-12, Certification Workshop, Washington, D.C.
Jan. 12-16, Certification Workshop, Seattle, Wash.
Jan. 26-30, Certification Workshop, Phoenix, Ariz.
Feb. 2-6, Certification Workshop, Denver, Colo.
Feb. 9-13, Certification Workshop, Tampa, Fla.
Feb. 9-13, Certification Workshop, Oakland, Calif.
Feb. 27, Design Management Fundamentals, Orange County, Calif.
Mar. 2-6, Certification Workshop, Atlanta, Ga.
Mar. 18-20, Owner Boot Camp, Orange County, Calif.
Mar. 25-27, Owner Boot Camp, Oakland, Calif.
Mar. 30-April 3, Certification Workshop, Long Beach, Calif.
Mar. 30-April 3, George Mason University Boot Camp, Herndon, Va.
Apr. 6-10, Certification Workshop, Kansas City, Mo. Apr. 20-24, Certification Workshop, Spokane, Wash.
Apr. 27-May 1, Certification Workshop, Sacramento, Calif.